thanks to all the Minnesota iceboaters in who helped me get up to speed. With out their help it would have taken me ten years to get where I am now, if at all. 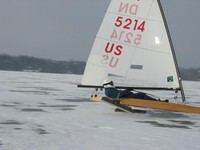 It's really the best part about iceboating, racing around with your friends trying to figure out how to go faster. It's funny because I really like the solo part of the iceboating... but you really have to work in a master/apprentice/tuning partner team type way to get going and to figure out what is fast, and that was pretty great getting to know everybody, the enthusiasm is really infectious. In fact everybody involved in racing DN's have been very helpful with all the questions/problems that I've had. I had a great regatta. My last two races put me down in the score board, but this was the first regatta that i put it all together for a couple of races and was rewarded with 14th and 15th places. The good news is that I know that i can get quite a bit more speed out of the boat. I have to work on a number of different problems. Well i got out on the ice and put the alignment plates on my runners and eager to find out how i did in the basement.. So back to the drawing board, unglue the chocks, and realign with a better alignment method. Surprisingly, after less then five minutes of a heat gun and a thin scraper the chock's popped right off. The epoxy had hardly stuck to the chocks. No reason not to glue when they come off that easy. A little sanding and I was good to re-epoxy. some people are really using the site. I love it that people are using the blogs and the site gallery. I never know how people will react to the site, but so far i think it's been really good. 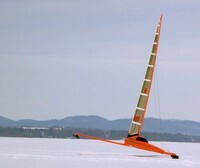 It would be cool to get some of the more experienced sailors to do a couple of pages on things like, a racing tack, runner profile and alignment, modern mast tuning, driving in partial snow cover, essential gear to bring to the regatta, etc..
Another thing I'd like to do is to load up all the IDNIYRA scores in a database, then you could graph your ranking, and compare yourself to your archrival, or see your ranking over history, etc.. I tried a couple of different methods to make sure they were parallel. I did it with the plank off of the boat. The theory is get the chocks straight and then fine tune with the runners. 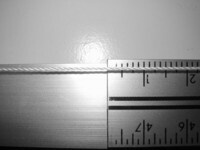 first i had 2 48" drywall tees hooked to the outside of the chocks, and then a 5' level to line the to up. I wrapped bike inner tubes around the level and the tee.. and wha-la i had a jig. But then after i was done i put the level on the chock fore-aft like an runner and then measured each end of the level- back through to the inside of the opposite chock's axel hole. That worked better i think. All and all it took me quite a while. The relaunch looks pretty sucessful. One super cool picture post. And I found a boom. It happens that quick. I think a dozen users out of seventy logged back in, not to bad.. Maybe more later, i hope i didn't alienate anybody by having the site dark for so long. At one time I think we had 30 guests..
We can now post pictures, or I can batch load a bunch of pics. The personal gallery is a bit funky. No folders on personal gallery pages.. but that's okay. I'm playing around with the themes... so you might be getting a different look.. but it's the same stuff..
We got our first response in the forums. I think we are about to go live. I would like to get the FAQ, and photo Gallery going..